With Blue Mail Media’s verified and updated Convenience Stores Email List, you get an opportunity to reach and target the potential buyers in the convenience stores industry. The list is a highly comprehensive marketing database designed by aiming at the unique challenges that you might face while creating and running a multi-channel marketing campaign. We house an expert team of data analysts and market specialists that gather the contact details of the convenience stores professionals by using some of the most credible sources such as company newsletters, exhibitions, seminars, and public filings. The highly opt-in emails and mails in the Mailing List of Convenience Stores will improve your conversions and increase the ROI. ‘Data,’ the secret to a successful marketing campaign, is no longer a secret now! Businesses of every size are discerning the relevance of data-driven marketing. However, what creates chaos in doing a successful data-driven marketing is – the lack of reliable data. Blue Mail Media has got the one-stop solution to the problem! 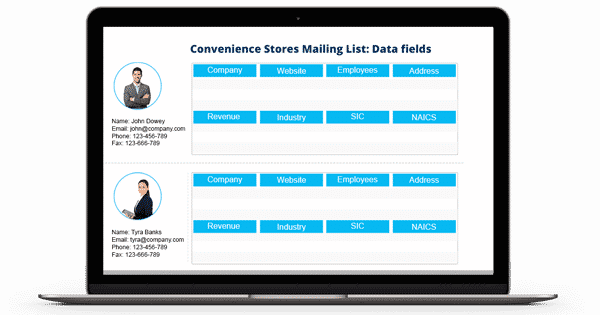 Our Convenience Stores & Gas Stations Email List is a data repository that encompasses verified and updated contact details of the convenience stores and gas stations professionals. The details include – Name of the company/individual, Email address, Phone number, Official address, Home Address and more. You can also get the database customized according to the needs or challenges of your business.